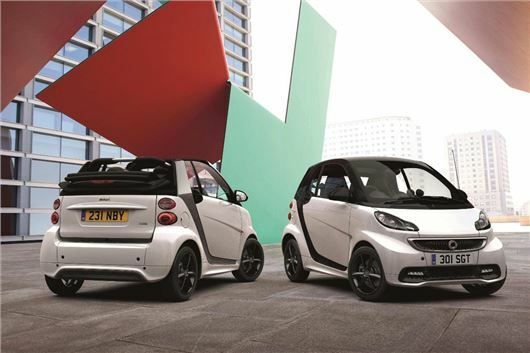 Smart has introduced a new Grandstyle version of the ForTwo. Priced from £10,300, the Grandstyle comes with Artico artificial leather upholstery, 15-inch alloy wheels, black or titanium coloured detailing, a touch-screen audio system and LED running lights. Coupe, glass-roofed and cabriolet versions are offered, with a choice of 72PS or 85PS engine. It’s available in a choice of five colours, with three choices of colour for the Tridion safety cell. Optional extras include a cup holder and a comfort package with heated seats and heated door mirrors. Smart is offering the Grandstyle for £99 per month over three years with a deposit of £1499. There’s a £777 deposit contribution from Smart and 0% APR, with an optional final payment of £4490 to keep the car at the end of the three-year period.